Never was there a more divisive politician than Margaret Thatcher, the Iron Lady. Now a frail old lady suffering the unthinkable degradation of Alzheimer’s (a fact thoughtfully revealed by her daughter Carol as a promotional tool for her new book in 2007), in her prime the Iron Lady was a phenomenon that has been missing from British politics since the demise of her tenure at No. 10. She was a conviction politician, a steely leader unafraid of making unpopular decisions if she believed it was for the good of the country. Whether you agreed with her leadership style or not, it would be foolish to pretend that she was never less than faithful to her core beliefs – something you can’t say about today’s insipid politicians who, to paraphrase Thatcher in The Iron Lady, are more concerned about their careers than what’s right for the country. The film opens with an aged hand tremulously reaching for a pint of milk from the shelf of a corner shop. The hand belongs to a frail Margaret Thatcher, the woman who ended the provision of free milk to school children during her time as Education Secretary. Paying for her milk, she appears lost as she makes her way home. Immediately, we wonder what has happened to the formed Prime Minister’s bodyguards, and the suspicion that what we are about to see is forged more from the imagination of writer Abi Morgan than historical fact is aroused. Back home, as uniformed police bicker over how Thatcher slipped out unobserved, she converses with her loyal husband Denis (Jim Broadbent) who has actually been dead for more than five years. Thatcher is in the grip of Alzheimer’s, you see. The Mighty has fallen, reduced to a shambling, hallucinatory ghost. In a flashback, as the young Denis asks Margaret to marry him, she tells him that she will only do so on the understanding that she will never be a housewife remote and alone in the kitchen, doing the washing up. At the end of the film we see the aged Thatcher, alone and befuddled by dementia, washing a teacup in the kitchen. In between these episodes, her life and her twelve-year tenure as Prime Minister are explored with all the depth of a stone skimming across the surface of a lake. 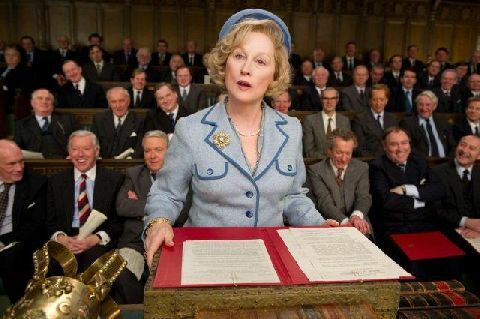 Meryl Streep plays Thatcher, and as you’d expect from such an accomplished actress, she makes the part her own, not simply mimicking Thatcher’s mannerisms and speech patterns but seeming to inhabit the role. It’s a shame that the movie doesn’t manage to achieve the same, but it lacks the integrity and resolution of its subject, and has more in common with Thatcher’s timid, vacillating underlings than the Iron Lady herself. Thatcher presided over a turbulent era in Britain, an era which included terrorist atrocities on the mainland, a miner’s strike that threatened the very foundation of the government, and a war waged on a tiny island thousands of miles away; each incident would have provided an abundance of material necessary to deliver a comprehensive insight into the woman, her qualities and flaws, but Morgan’s misguided scattergun approach tells us little about Thatcher that we didn’t already know. It’s a piece of fiction, plucked more from Morgan’s imagination than historical fact, and as such it has little intrinsic value.